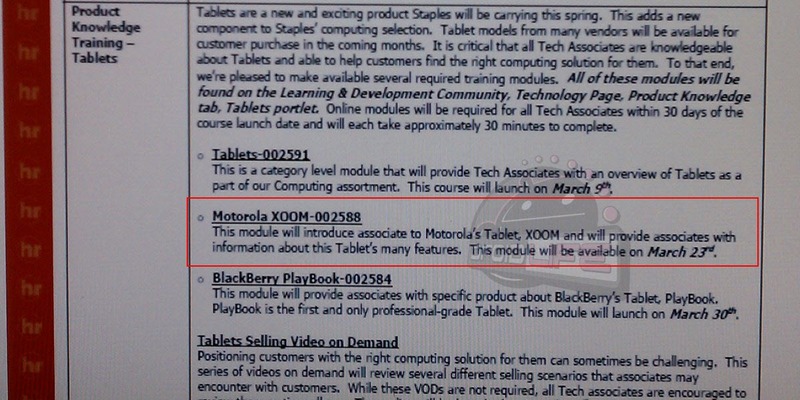 We were tipped earlier to the possibility of the wifi-only Motorola XOOM hitting Staples store shelves by April 3rd, or at least showing up in that day’s Sunday ad. Well, we just received a second verbal confirmation plus the screenshot above which talks about training for the device. On March 23rd, employees will begin to receive information for this 3G-less XOOM, helping with the theory that the first week of April is indeed the target for Moto. However, we should point out that the document above does reference a 30-day window for employees to complete training on tablets which could mean that they want everyone ready before they actually start selling them. I guess we’ll know in a couple of weeks. 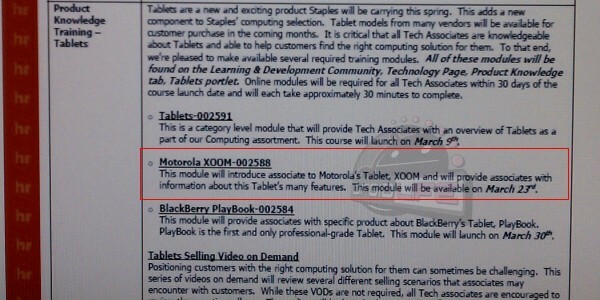 On a semi-related note, you’ll see that Blackberry Playbook training starts on March 30th. Have to figure that it’ll be available shortly thereafter.